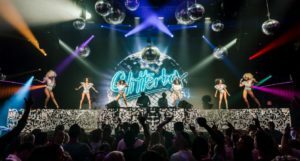 Hï Ibiza has responded to clubbers’ demands and realigned its ticket price structure for the forthcoming 2018 season. The locale has created a Super Early Bird ticket price of just €20 in a challenge to the prevailing rates on the White Isle. The realignment was announced in tandem with details of Glitterbox’s 2018 residency. Following their debut 16-date run at the brand new club in 2017, the flamboyant extravaganza returns this year for 17 dates. The residency launches 01st June and will run Fridays at Hï Ibiza through 28th September (excluding 03rd August). The new set of dates promise the same 21st century disco vibes with even more star-studded line-ups and dancefloor glam. Glitterbox is set to release a new compilation, ‘Love Injection’, on 16th February. Selected and mixed by Simon Dunmore, the compilation is set to feature cuts from Gwen Guthrie, CeCe Rodgers, Purple Disco Machine, KiNK and Midland.